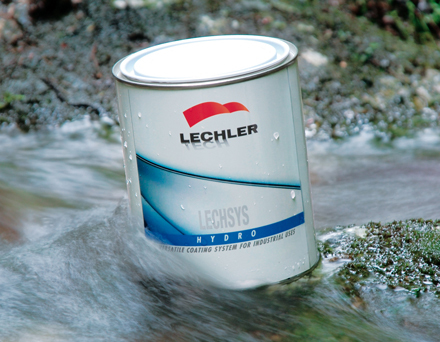 Introducing LECHLER, LECHSYS, LECHSYS EFFECT and LECHSYS HYDRO, these are versatile industrial tintometric coating systems which produce an extremely diversified product range. They represent a complete system offer comprising technology, product range, colours, service and support. A multi-purpose system created to reproduce all the pastel colours and some metalized colours. More than 10,000 industrial pastel colours, with which all the most important colours in the market including the major international standard colours (Ral, British Standard, Afnor, NCS, Industrial Vehicles etc.) can be produced, make it possible to meet every request in the target market confidently. The colours available have been extended with the addition of the new Master Chroma range, containing more than 2,800 glossy reference colours organised in chromatic order. It is possible to produce anticorrosive primers and epoxy, epoxy-acrylic, synthetic, synthetic-phenolic and epoxy-ester basecoats, wash primers, polyurethane and polyacrylic fillers. It is possible to produce different types of single component topcoats: synthetic, alkyd, nitro, acrylic, epoxy-ester, vinyl, chlorinated rubber, nitro and double layer. It is possible to produce different types of bi-component topcoats: polyurethane MS and Ultra HS, acrylic MS and Ultra HS, epoxy, soft-touch and nitro. Many topcoats are available with different finishes: gloss, matt, satin, texture, orange peel. Represents the evolution of the basic system of Lechsys which makes it possible to produce all colours with special effects: mica, pearlescent/metalized and pastel. The Effect module makes it possible to produce metalized, mica, pearlescent and pastel colours which can be chosen from the Master Chroma effect colour range for 1,000 metalized colours in gloss and satin finishes and with the new Master Chroma for 2,800 pastel colours. It is possible to produce double layer matt basecoats and single layer topcoats for the plastics and O.E.M. quality metal sectors. 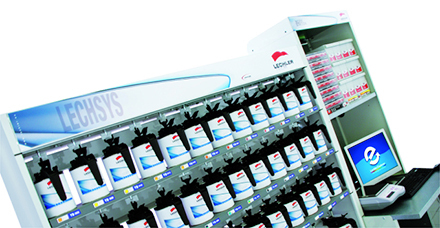 This the first water-based multi-purpose colour mixing system by which painting solutions with LOW V.O.C. can be obtained and which can offer new technical and aesthetic options both for the specialist distributor and industry. More than 10,000 industrial pastel colours from which it is possible to obtain the most important colours in the market, including the main international standard colours (ral, British Std, Afmor, NCS, Industrial Vehicles etc.). The colour range will be completed with the 2,800 shales. Available in the Master Chroma colour chart and the 1,000 shades in the Master Chroma effect colour chart. Double layer matt base coats and single layer topcoats can also be produced.